Front Row: Bryan Howard, Ray Jones, Robert Plummer, Rex V. Symonds, Robert Blosser, Deloss Harman, Carroll Hani. Second Row: Dale Miner, Delbert Lutes, Devon Roberts, Eddie Thwaits, Clifford Lutes, Gordon McCormick, Harold Templin, Charles Zimmerman, Harold Wallace. Third Row: Iva Marie Estep, Edna Mast, Caroline Blosser, Geraldine Truex, Mary Ellen Plummer, Leonah Mast, Vena Beck, Betty Holdenman, Martha Hamman, Elnora Murphy, Helen Jeanne Symonds, Mary Truex. Top Row: Viola Mast, Wilma Harman, Ethel Konkle, Louise Anglin, Mary Yoder, Mary Jane Hamman, Estherbelle Harman, Fannie Yoder, Gwendolyn McCormick, Mary Yeiter, Sarah Jane Gerard, Louis Harman. 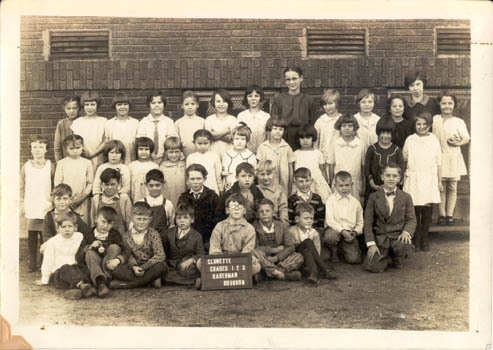 NOTE: Robert Plummer teaching at Etna Green in 1946.